yields with big tubers and a uniform sizing. Cooking type B, fine taste, no discoloration after cooking, easily washable, suitable for early harvesting, not susceptible to internal defects, suitable for processing of early French fries, starch content 12 – 13 %. Medium number of big sized tubers, uniform grading, very high marketable yield. Oval to long-oval, skin yellow, smooth shallow eyes, light yellow flesh colour. Strong erect stem type rapid development and foliage cover, red violet flowering. 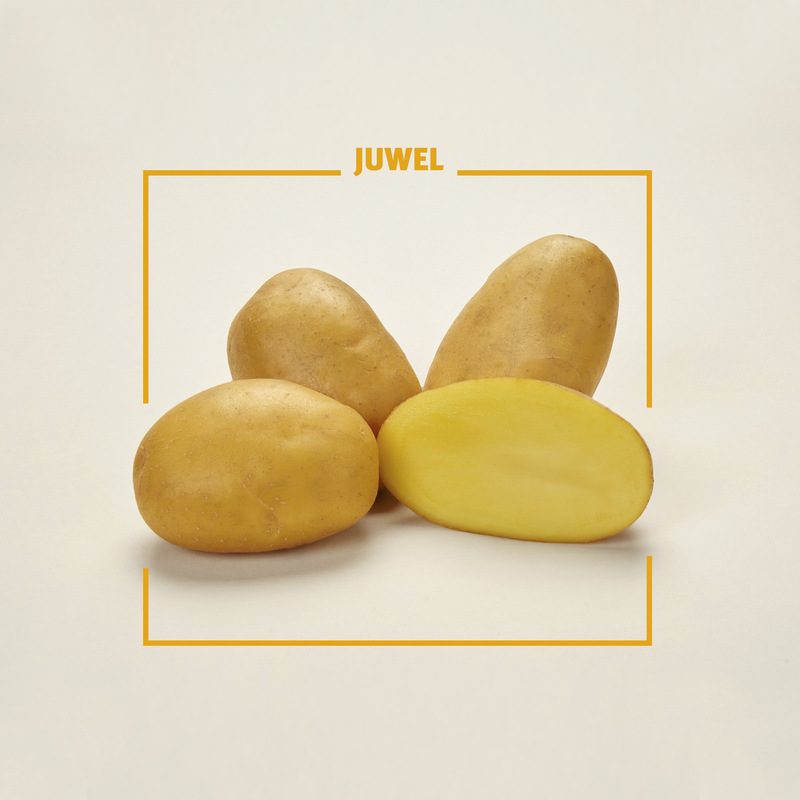 Juwel is suitable for all kind of soils, seed tubers should be pre-sprouted. As a precaution seed treatment against Rhizoctonia solani is recommended. Juwel should be planted in rows allowing 28 – 30 cm between tubers and 75 cm between rows in a well-prepared seedbed. Juwel is not sensitive to Metribuzin. Use a very strong Phytophthora program: especially first application in time by a strong systemic fungicide is very important; afterwards routine chemical control depending on weather conditions. Crop should show senescing before killing the haulm. Dry matter content should be more than 18 %. Skin set should be finished before harvest. Avoid mechanical damage during harvesting. Avoid fluctuation of temperature during storage otherwise sprouting is possible.